All hoses have plastic hose guards except for the 1/4" I.D. polyurethane hoses which have spring guards. 3/8" NPTF fittings on both ends and a 700 bar operating pressure. All hoses comply with MHI standard IJ100. At SGS we have an extensive range of hydraulic hoses and hydraulic hose supplies for sale. Shop our selection of hydraulic pipes and connectors below to find the perfect hydraulic hose supplies for you. 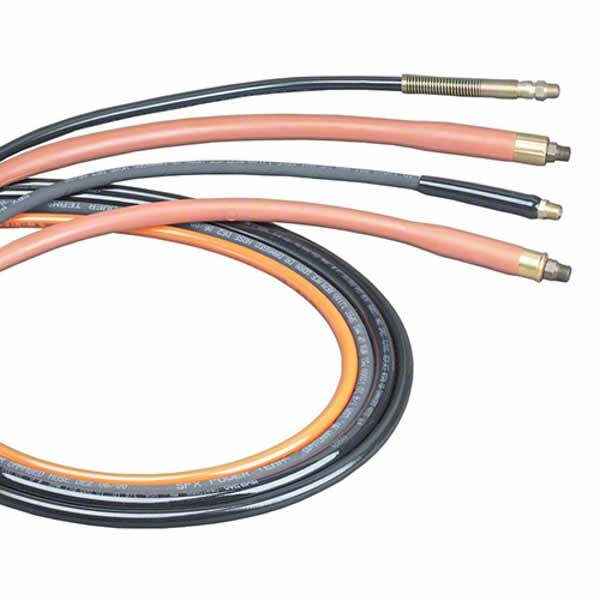 Used to provide flexibility for machine operation and maintenance, you can rely on all of our hydraulic hoses to be top quality. All of our available hydraulic hoses have plastic hose guards except for the 1/4" I.D. polyurethane hoses which have spring guards. They can also feature 3/8" NPTF fittings on both ends and a 700 bar operating pressure. All hydraulic pipes comply with MHI standard IJ100. Non-conductive hose - For applications requiring electrical isolation by the hose, non-conductive hose has a leakage factor of less than 50 microamperes, considered a safe level of conductivity by SAE standards. The covering is polyurethane and coloured orange for easy identification as non-conductive hose. The covering is not perforated, preventing moisture from entering the hose and affecting its overall conductivity. All non- conductive hoses have a minimum burst pressure of 2,800 bar. Rubber hose - 2-ply rated hose reinforced with two braids of high tensile steel wire. The rubber covering is oil and weather resistant. These hoses are MSHA approved. No. 9764E – Hose assembly consisting of 9767E (1.8 m hose), 6.4mm I.D. polyurethane with 9798 hose half coupler and 9800 dust cap. No. 9754 – Hose assembly consisting of 9756 (1.8 m hose), 6.4 mm I.D. rubber with 9798 hose half coupler and 9800 dust cap. When you’ve found the hydraulic pipes, or hydraulic connectors that you need simply place your order and we’ll have your items with you in next to no time. If you need any assistance with your purchases though, contact our team and we’ll tell you all you need to know. Our expert staff can advise you on everything from hydraulic pipes to which hydraulic hoses are the right choice.